Masada isn't mentioned by name in the Bible, although it was an important site during the New Testament era, during the first century AD. King Herod, according to the first-century Jewish historian named Josephus, built a fortress on Masada to protect himself in case there was a revolt. Herod was appointed "king" by the Romans to govern over the Jewish people. He was extremely unpopular with the people. "Masada" is a Romanized word for the Hebrew Mitzada, which means fortress. 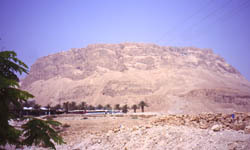 The site is an isolated plateau that overlooks the Dead Sea. It is on the eastern edge of the Judean Desert, in the sourthern part of the land of Israel, not far from Jersualem. Decades after Herod died, there was a massive revolt among the Jewish people to free themselves from the oppressive rule of the Roman Empire. A group of Jewish fighters defeated a Roman garrison and captured Masada, which then was used for about two years as a base for some of the Jewish fighters. The revolt, sometimes called the First Jewish-Roman War, ended in 70 AD when the Romans completely destroyed the city of Jerusalem and the Temple.